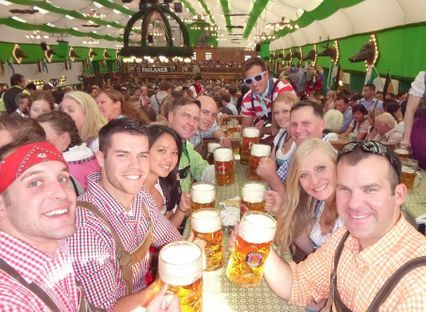 Stuttgarter Frühlingsfest, or Stuttgart’s Spring Festival, is the little sister of Stuttgart’s autumn Cannstatter Volksfest. Located on the same fairgrounds as the Volksfest (the Cannstatter Wasen in the Bad Cannstatt district), the spring version is held from the middle of April to the beginning of May and features the same sort of rides, attractions (such as the 47 meter tall Ferris wheel) and food… including the bier tents! The Fruit Column, a tall wooden structure decorated with fruits, was introduced to the Stuttgarter Frühlingsfest in 1995. Originally it was only present at the autumn Volksfest, but in 1995 it was left to stand on the festival site all year round. Just because this fest is on a smaller scale than the one in the fall doesn’t mean the visitors are any less jovial. Come along and join us in a bier tent for a couple maß and a half a chicken, and pretend to know the words to all the Deutsche drinking songs!